Two days ago I reported on the Belgian Presidency's latest compromise text for a EU patent language regime based on documents 5395/10 and 15395/10 ADD1 of 8 and 9 November 2010, respectively. This compromise was hoped to have the potential to break the deadlock and lead to a historic deal at an extraordinary Competitiveness Council on 10 November 2010. Most [i.e. not all] delegations have shown greater flexibility than ever before, because the Council understands the importance of securing an EU patent system [...]. I would like to express my sincere gratitude to all those delegations who have made efforts and shown flexibility to bring us so far. We have left no stones unturned. However, in spite of the progress made, we have fallen short of unanimity by a small margin. As reported on IPJur, Mr Vincent Van Quickenborne explained in a press conference, that 26 of 27 delegations "were in negotiation modus" while "one delegation apparently did not have a mandate to negotiate". As a matter of the fact that the Lisbon treaty requires unanimity in all language issues, "other avenues in the (Lisbon) treaty" will now have to be considered, i.e. the enhanced cooperation. Mr Van Quickenborne also said on the press conference that "things are clear now: there will never be unanimity on an EU patent". 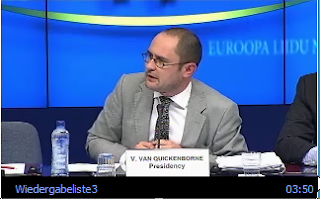 It is reported on EurActiv that Mr Van Quickenborne's latest efforts appeared to have swayed Poland and Portugal, while Italy and especially Spain remained reluctant. While Andrea Ronchi, Italy’s Minister for European Policies, said that "we understand this is a matter of urgency, but the matter will require further in-depth discussion", Diego Lopez Garrido, the Spanish state secretary for the European Union, was cited as "we cannot accept discrimination". Apparently, Mr Lopez Gerrido (who probably lead the one delegation not being in negotiation modus) did not even consider the new proposal's idea of a transitory period, since he argued that after six years or so the EU Patent most likely would be reduced to the 'Munich' three languages system (as suggested by the European Commission on 30 June 2010), which the Spanish Government finds inacceptable. The most likely "other avenue in the Lisbon treaty" now appears to be an enhanced co-operation, i.e. an EU legislative agreement among a small group of EU members. Although such a mechanism has been permitted already in the Amsterdam Treaty of 1999, it has not yet been used since it is considered somewhat against the EU philosophy. In fact, the Schengen agreement and the EURO, which also are in force only in certain member states, have not been implemented by an enhaced co-operation but by other legal mechanisms. But there is also an obstacle to this option. While only nine member states have to agree to take part in the enhanced co-operation, it needs to be authorised by a qualified majority of member states, whereas it is unknown if that can be achieved. That is, one cannot be overly enthusiastic about the prospect of success of this option either. Regarding this option, the IAM blog knows that "a group of countries, the UK, Sweden, the Netherlands, Slovenia and Ireland (though not, it seems Germany and France), wrote to the Commission to signal [the enhanced cooperation] as a way forward. There are, however, significant obstacles to it actually happening as member states representing 62% of the EU population would have to agree to it. If Spain plus Italy and, say, Poland said no then that would be a very big obstacle to get over."